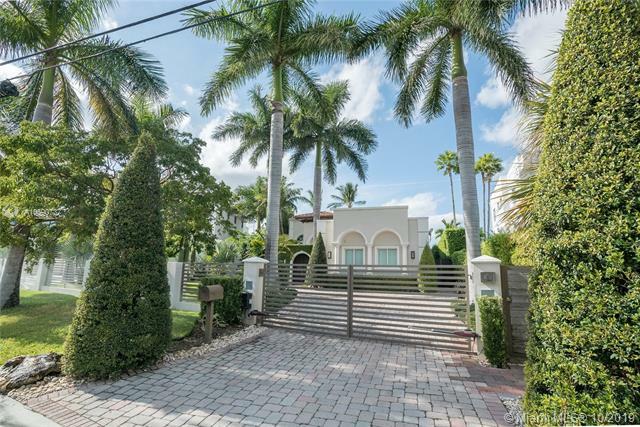 Breathtaking views from this Waterfront Home in Private Miami Beach Normandy Island Golf Course Community. Sitting on a 11,050 SF Lot this unique property has 105 Lineal Feet of Waterfront on wide open bay. Large private dock includes 2 jet ski lifts with seawall in good condition. Quick access to the open ocean. Home has 4 Bedrooms 4 Full Bathrooms with vaulted ceilings throughout home, impacts windows & doors. Private Master Suite Upstairs with Large Balcony to enjoy the view. Large open Kitchen to Family Room with Bar & Wine Refrigerator. Youll enjoy sunsets and panoramic views of the bay from the pool area and covered terrace with outdoor kitchen. Perfect for entertaining inside & out. This Rare Gem in Miami Beach is waiting for you. Enjoy Golf Course & Tennis Courts in the community. The data relating to real estate for sale on this web site comes in part from the participating Associations of the Miami Realtors Multiple Listing Service. The MLS data provided for the property above (MLS# A10590737) is provided courtesy of (RD Realty Group, Inc.). The information being provided is for consumers' personal, non-commercial use and may not be used for any purpose other than to identify prospective properties consumers may be interested in purchasing. Information is deemed reliable but not guaranteed.